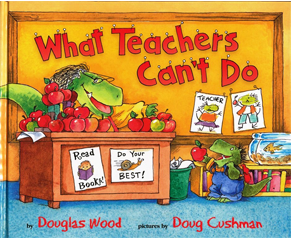 There are lots of things that regular people can do, but teachers can’t. Teachers can’t ride a bike or scooter to school. And they can never be tardy. Teachers can’t buy their own apples. And they can’t teach their best without flowers on their desk. But first they really need some help cleaning the blackboard. And the erasers! It’s a wonder they come back to school at all!